Three ski tourers have been killed by a major avalanche above the village of Ecole in the Bauges mountains. One of the victims was found rapidly, it appears he had been critically injured after being thrown against a tree. The other two were found by an avalanche dog buried under over 3 meters of snow. An important rescue operation consisting of three helicopters, two resuscitation teams as well as personnel from the fire brigade and mountain police were on the scene. The accident occurred at around 15h30 in the Bellevaux Valley. The group, ten members of the French Alpine Club (CAF) from Annonay in the Ardèche who were staying in the area had just completed a ski tour of the 2000 meter Mont d’Armène. They were at 1300 meters and had just taken off their skis to descend a forest path to the road at Nant-Forchu. The full-depth avalanche, apparently consisting of two separate slides, had started higher up on the bowl of the Combe-Fort at around 1800 meters altitude. Some of the group were able to save themselves by grabbing trees. The slide finished in a narrow gulley and snow banked up to several meters depth. Due to lack of mobile phone reception the rescue services were only alerted at 16h50 after two members of the group reached the village of Ecole-en-Bauges. Six members of the group were airlifted to hospital suffering from minor injuries and in a severe a state of shock. According to one rescue worker the warm conditions were a crucial factor in the tragedy with a humid surface layer sliding on a frozen base, something rarely seen in the mid-mountain altitudes of the Bauges. The victims, Marcel Rivory, Joël Orand and William Tisserand were respected members of the CAF and had lead a numerous trips. 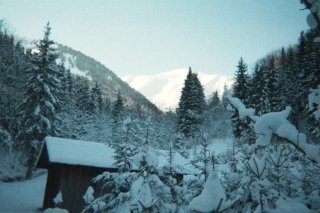 In December 2002 four members of a French Alpine Club group from Montpelier were killed by an avalanche on slopes close to la Grave. With the change to spring conditions and the large accumulations of snow in the Northern Alps, Pyrénées and Corsica there is a risk of wet snow avalanches, during the course of the day. Some of these could take the full depth of the snowpack. These avalanches are extremely powerful and the density of the snow is a major factor affecting survivability. The slide was a full depth avalanche and it would seem that the victims were killed due to injuries sustained by the slide or being pushed though trees. The avalanche appears to have started high on the Pointe de Chamosseran on west facing slopes, it was possibly triggered by a corniche collapse. It hit the CAF group lower down. Despite the sprint weather there has been a lot of snow recently accompanied by strong winds and condtions are not that stable. I was out this morning and one north facing slope had a lot of snow on it which had formed into a soft slab and was poorly bonded to a weak layer. South sector slopes also have a lot of snow on them which has not yet purged or settled. Take care later in the day as the sun warms slopes from the east through to the west.